I think I might owe you an apology. I may have accidentally abused my powers. You see, on Monday, I posted the contest rules for the Pretty Much World Famous 4th Annual Holiday Contest. If you have read them, you will know that the subject matter is wild weather. I was merely thinking we could have tons of fun with that topic. . . But here we are, within hours of that posting, and the temperature is 12 degrees in mid-November! In New York! (not the Buffalo part! where there are already 3 feet of snow with 3 more predicted!) in the semi-civilized part not that far from NYC! I’m going to do my best to turn things around by buying a new pair of expensive warm winter boots (Sorel. Model: Women’s Caribou. Color: Cinnamon. Or maybe Slate. Size: 7.5 – or maybe 7 since the reviews say they run large.) That should pretty much guarantee that we won’t get any snow. But of course that will be unusual too… so there we are, back at wild weather! I’m afraid I’ve caused it coming and going. You just have to be sooooo careful when you have magical powers! One little moment of inattention, and whoops! you’ve unleashed Winter 2014-2015! Let me try to distract you with a look at the fabulous pitches from October which await your voting pleasure for the October Pitch Pick. A strange looking restaurant pops up in a small ho hum farm town offering fine cuisine. A real stir is created as these plain Jane folks can’t swallow much more than meat and potatoes and common sense. The Grand Opening announces a real eating adventure. Once inside, Master Chef Antonio will transform the taste buds that will take them to exotic places with just one bite. Ted discovers a teeny-tiny zombie, and quickly learns that the little monster packs a big appetite. The little boy sets out to feed his famished friend, leading the pair on a whacky adventure — meat kabooms, a plate is pinched, and a restaurant is invaded! Ted’s quick thinking sees Zombie’s tummy finally fill, and his own dream of becoming a chef come true. “Me Hungry!” is a fast-paced, 500-word picture book. A little “Master Chef Junior” meets “Goosebumps,” the story features Ted, a boy who learns that facing his fears is the first step in making his dreams come true. Finally, an invitation! According to the instructions, Conrad must bring a sword, a bow and arrows, and … exactly ten marshmallows?! He eagerly sets out for his best friend Fiona’s new home. But his journey quickly becomes complicated by a leaky boat, prickly brambles, and a sweets-loving dragon lurking in the moat. Will Conrad have the wits (and enough marshmallows) to make it to Fiona’s front door? Please vote for the pitch you feel most deserves a read by editor Erin Molta in the poll below by Sunday November 23 at 5 PM EST. Now then, since the Mid-Hudson Valley is in the grip of the polar vortex (I know! My fault!) and I am therefore freezing ( I know! Still my fault! 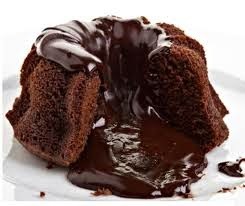 ), we shall have something warming for our Something Chocolate today… Molten Chocolate Cake!!! Now that we’ve averted the danger of freezing AND wasting away into skin and bones, let’s jump into Would You Read It! The Pitch: Most of the Knights of the Kids’ Table found Flooted funny. After all, when he got nervous, Flooted tooted. But cranky Hugh couldn’t stand the smell, so he hatched a plan to get rid of Flooted…for good. When Hugh’s scheme flopped, the little knights giggled, the big knights enjoyed silly sword fights, and the grumpy little knight got exactly what he wished for. “The Knights of the Kids’ Table” is a 554-word, humorous myth set in a time when swords were silly, and playing cards were the hottest toy. Little readers will be sure to chuckle when they learn the unlikeliest and silliest way some of today’s gaseous gags were coined. I'm late to the party – and haven't read much below – so just my thoughts. I found “Flooted” off or weird – do you HAVE to give the character a name in the pitch? Might work fine without. Just a thought. Also not feeling the need for the second paragraph – though I wonder if you could work the info about the “Origin of fart gags” into the first somehow. Cuz it may just me, be but THAT grabbed my attention more than anything else. And as you know, Susanna, we've got the polar vortex thing too – though not as bad as upstate NY! Hoping we aren't in for another winter like last year. Thanks for your comments for Gail and for voting, Penny! 🙂 And I'm so glad you enjoyed the cake – of course you may always have as much as you like – I try to be sure there's MIK (more in kitchen :)) I would be happy for the opportunity to use my powers for good, so I will trot down to West Texas in my fanciest sun hat… which is sure to bring rain immediately!